The latest release by Twin Cities based Norwegian Ole Ask takes its name from the Oslo to Minneapolis flight number. This is Ask's third album for the TC based Narnian label, and once more sees him teaming up with several highly respected locally based musicians. 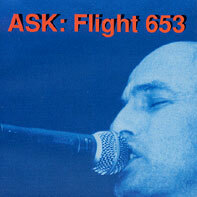 "Flight 653" takes off gently with "Looking At An Angel," a fairly laid back affair with shades of Springsteen about Ask's smoky vocals. This then gives way to "The Radio Is On" where "Mellow Down Easy" meets "Got My Mojo Working" for a rock and blues workout. Lamont Cranston's Pat Hayes provides the excellent harp, for a song which contains a line that we can all agree with: "Thank God for blues, country, rock and soul." Although not a blues album--Flight 653 is nothing if nor eclectic--there are some other bluesy moments. Most notable of these are "All of Me, All of You," possibly the best tune here, which has a good blues feel permeating it, and "What A Pretty Girl I Got On My Mind" with its rollicking piano from Willie Murphy. The album also includes shades of Dylan, such as on the impassioned "I Need You I Want You" and "Here We Go Again." Variety is the order of the day, though, so you get a bit of a country twang on "State Of Mind," which features Spider John Koerner on harp, jazz elements on the bass and drum driven "All the Good Things," catchy pop ("Good Morning, How Are We Today") and driving rock on "We're Only Here For So Long" which has some fine sax from the Rick O'Dell. An easy landing comes courtesy of "To My Parents," a poignant number featuring Ask with a little (quiet) help from bass and drums. It is a simple but effective tune where Ask sounds nicely relaxed and at ease. "Flight 653" is a pleasant journey. Stylistically it covers most of the styles of music mentioned in "The Radio Is On." The only thing lacking is soul, but Ask certainly puts his soul into songs like "To My Parents." Ask writes good tunes, and as long as you can cope with a diversity of styles, you will find something here to enjoy on an album that rewards repeated plays.